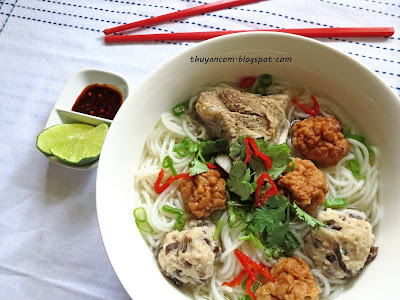 Bun moc is another soup originated from northern Vietnam. Not only does it have to go up against popular northern soup such as pho and bun rieu, it is overshadowed by just about all the other soup from Vietnam. While most of us are well acquainted with bun bo hue from central vietnam and hu tieu from the south; there is very little love for this humble soup from the north. Bun moc is a light soup made with pork bones and pork paste. Pork meat is ground into a paste and then used as the main meat of the soup. The pork paste is very similar to the ones you could steamed with banana leaves to make cha lua, also know as Vietnamese pork rolls. While my dad's breakfast of choice was pho, my mom prefer bun moc. She even had a favorite spot near my grandma's in Saigon. Even though I was my dad's pho buddy, I often accompanied my mom whenever she craves a bowl of bun moc. My favorite thing about bun moc is definitely the pork balls made by spooning glob of pork paste right into the broth. Most stall also offer deep fried pork paste and you can get fancy by mixing pork paste with some wood ear fungus. The pork paste for bun moc is slightly different from the pork paste used to make cha lua because cha lua's meat is dense and firm. Bun moc's pork paste on the other hand is very light and airy; it's like you are biting into chewy pork marshmallows. I love it so much so I often put pork paste in a lot of other soup like bun bo hue,bun rieu, mi, and hu tieu. My mom buys a freezer full of pork paste from Seattle, there is a deli that makes very good pork paste. Every now and then I would grab a few container when I visit home. If you like your pork paste extra fluffy, I suggest adding a tiny bit of Alsa baking powder (the ones in the pink pouch). Bun moc is another soup that is very simple to make and doesn't require the whole day. Use pork neck bones and a couple yellow onions to make the broth. Bun moc is also know for it's very light and clear broth so make sure you par-boil and rinse your bones well. Enjoy! 1. Par-boil your pork bones and then rinse with plenty of cool water. 2. Add clean bones to a 6 quart pot and fill with water. Let simmer on low-medium heat. Add two yellow onions. 3. Season with salt (3 tablespoon), rock sugar(thumb size), mushroom seasoning (1 tablespoon), and black pepper (1/2 teaspoon). And continue to taste and season with salt and sugar if necessary. 4. I deep fried 1 cup of pork paste and mixed the other half with minced wood ear fungus. 5. Prepare your noodles(vermicelli rice noodles),vegetables of choice, and garnish. 6. Taste your broth for the final time. If broth still need some saltiness, taste with fish sauce. 7. Spoon pork/fungus mixture right in the broth, you can ball it up ahead of time also. 8. When pork balls floats to the top, your soup is ready to eat. which deli in Seattle sells the pork paste? Insatiably Epicurious will benefit from this info! It's from Minh Tam, I think that's near Lemongrass?